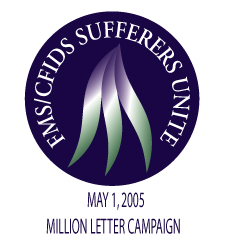 On May 1, 2005, FMS/CFIDS/M.E./MCS sufferers from all over the world sent letters to media and government addresses listed on the MLC site at www.fms-help.com/letter.htm in an effort to increase awareness of this illness in time for International Fibromyalgia Awareness Day on May 12. BELOW ARE RESPONSES WE RECEIVED. The lack of response was disappointing and made me wonder if we are as invisible as this illness! However, see #14 below for a GREAT LETTER from Marly Silverman of P.A.N.D.O.R.A. I really appreciate her comments! If you receive a RESPONSE from ANY of the addresses we wrote to (see www.fms-help.com/letter.htm), PLEASE CONTACT MLC FOUNDER, PATTIE CAPRIO, IMMEDIATELY at ivorycgd@verizon.net so they can be reported on this page. 1. Pattie Caprio, MLC Founder, stated: "I received two calls today (May 9, 2005) from the media. One was from Liz Frillici, Senior Supervising Producer for the Montel Williams show, and the other one was from FOX TV. Ms. Frillici was not too happy about the massive amounts of mail and asked why we didn’t just send one letter to her. I explained that we tried that in the past and we never received an answer. She informed me that she would have to discuss this with Montel to see if he would be willing to help our cause. She agreed that Fibromyalgia is debilitating and is a 'sister' disease to MS. However she could not tell me whether or not he would put us on his show. I asked her how many letters were received and she said 'carts'. She told me to tell every one that the campaign was 'extremely successful' and that I deserved a phone call. FOX TV is forwarding our mail to the National FOX station. Lisa Mancinni, from FOX TV, informed me she just did a story on FMS and can not do another one, but she was sympathetic to our plea for awareness." 3. An MLC participant reported: "I wrote my letter to everyone that was suggested on the website, and more! This past Saturday, I received a 'Proclamation' from our Governor Ernie Fletcher from the Commonwealth of Kentucky proclaiming 'May 12, 2005 FIBROMYALGIA AWARENESS DAY in Kentucky'!!!!!!! The proclamation is VERY professional, signed and dated by our governor. My sister (and I) was/were *VERY* excited. Thank GOD! And thank you all [in KY] for your efforts, too!" 5. Another report from Canada: "This is our local TV channel www.cfcn.ca - Click on Karen Owens video." This segment aired on May 12! 7. From a Million Letter Campaign worker: "On May 26, 2005, Mayor John Peyton of Jacksonville, Florida is signing a proclamation about Fibromyalgia Awareness Day." 10. July 1, 2005 - "I received a response to one of my letters - from the Prime Minister of Canada's office saying that they referred my letter to the Canadian Minister of Health - the Honourable Ujjal Dosanjh. It was signed by L.A. Lavell, the Executive Correspondence Officer." 11. July 18, 2005 - "I DID HEAR BACK FROM ONE OF MY SENATORS IN OHIO. HIS NAME IS GEORGE VOINOVICH AND HE SAID THAT HE KNEW ABOUT THE DISEASE--THAT HE WISHED HE COULD HELP, BUT HE'S NOT ON THAT COMMITTEE AND WON'T BE ABLE TO SPEAK TO CONGRESS UNTIL 2006 WHEN THE GO INTO [SESSION]. HE SAID IF I NEEDED TO TALK TO HIM OR NEED ANYTHING ELSE TO PLEASE CONTACT HIM. HE TOLD ME THAT THE NIH IS WORKING ON THIS MATTER." 12. July 22, 2005 - "I'm from Jacksonville, Florida. I did get a reply from my Florida congressman, Ander Crenshaw thanking me for sending the letter, etc. I was very surprised when I received it. Although he did say his office did not handle this issue." 13. September 3, 2005 - "My letter was printed in the Albany, Georgia Herald on May12. In its entirety. Then I was contacted by one of the editors of the paper who wanted to do a more in depth story on me and the one other person from our support group who also sent them a letter. They ended up doing a story on her; I got a full time wonderful job at about the time they wanted to do the story, and I just couldn't get to it." The results of the Million Letter Campaign were not meager at all! It aroused the troops within our advocacy community and it created the momentum to get things accomplished. The task was easy for patients to follow and they were simple and effective too. Many more in the media are now fully aware of CFS and FM. I do believe the campaign reached most of its goals which was to raise awareness – symbolically in the beginning, but it is the first step moving on towards gathering enough community awareness to get the attention of our government representatives. Concurrently with what the Million Letter Campaign was trying to do, P.A.N.D.O.R.A., (please note that our letter writing campaign to Congress never stops, every day is CFS/FM Lobby Day!) and other organizations – The CFIDS Organization of America, (with their new advocacy action center), the NFA and many other state organizations mobilized a letter campaign to our congressmen and to the Secretary of Health – (DHHS) who was also included in the MLC. Unfortunately, his name was included at the bottom of the less predominant list and you placed below him our congressional representatives. For the Canadians you did include their health minister second on their list. As we all know, public health is big business and it is now one of the major issues driving and even influencing citizens to vote favoring one or another politician in the state or federal level. Even the post of the Presidency is now influenced by this issue. I sincerely believe the time is ripe for our neuroendocrineimmune disorders community to use our political clout and power. For far too long we have underestimated such clout. Many of us merely thinking because we are disabled and we can’t work; or feel like we are not contributing to society; or we may have state assistance or we have to rely on our families and friends, that we don’t count. Well, we certainly do! Disability does not have to mean helplessness! From these advocacy efforts (yours included), literally thousands of letters were written to the NIH, as reported by Dr. Eleanor Hannah from the NIH Office of Research on Women’s Health on Sept 12, 2005 CFSAC meeting at the Department of Health and Human Services that I attended. She stated that the NIH (and the DHHS as well) received thousands of letters from advocates complaining about their lack of funding for CFS. To really drive this home, they also received at least 15 letters from congressmen concerned about lack of research funding and these letters specifically included the 11 recommendations the CFSAC (Chronic Fatigue Syndrome Advisory Committee – http://www.hhs.gov/advcomcfs/sept_meeting_min.html) listed to then Secretary Thompson, now Secretary Leavitt. Although we haven’t received a formal response from the Secretary’s office, the feedback is that they will move to follow the recommendations. I am including two of the letters as attachments to you. They are “shell” letters and they are specific for CFS. I am sure you are aware of them. I also attached copies of one of Rebecca Artman’s presentations and one of mine to the CFSAC in 2005. It will be at least another 4 months as the next CFSAC mtg is scheduled for Jan 2006 to hear of any possible results, mind you that 6 members of the committee are due to leave on Sept 29, 2005 and they are now selecting new ones. It will take from 2-4 months for these committee to review nominations, recommendations to be made to the Secretary of Health, background checking be conducted and then names be appointed. I called the attention of the committee that change in guard should not prevent them from continuing the work as the committee members who are due to leave can have their term extended to 180 days or actually be re-appointed for another term. P.A.N.D.O.R.A. and many other organizations united in the selection/appointment of many outstanding names for the committee. We are waiting to see what it will happen. Names will be announced in the next two months or so. The media does a great job to expose deficiencies in the health/medical system, but it can’t follow up or keep with the pressure to move the cause to implementation, there is always something new or more exciting to report. As advocates need to own the fact that it if affects us, we need to take charge. We need now to move the effort to the legislature. Folks need to write to their congressmen (federal and state), visit their offices and follow up on the issues. For every victory on the legislative side it literary takes from to 2-5 years of hard work, money and personal resources to succeed. It is all about baby steps and more than anyone else, we know what baby steps entail. 1. First, to thank you both, for your dedication to our cause and to let you know that although you may be feeling or experiencing some disappointment on your part, it should not take anything way from the hard work and focus you both presented during the Million Letter Campaign. The results were awesome! Folks talked about the campaign, favorable opinions were shared by the thousands of folks who answered your call to action, families united behind a sick member, employers became aware of the consequences of lack of medical treatment, CFS/FM patients felt that they were not alone, in churches, synagogues and in places of worship folks were discussing the MLC. 2. My hope was to provide you with a little insight and humble feedback about the amazing efforts of the MLC. I am always fine tuning and evaluating P.A.N.D.O.R.A.’s efforts. Not only because of my lack of experience in some items, but also because the goal is to get it right, hoping to learn from my mistakes. One thing I learned is that on the course of our lives, sometimes we are teachers, sometimes we are students. 3. If you are going to do the campaign again in the future, one suggestion I have for you is to contact some of the organizations who are already involved in similar letter writing campaign and coordinate the efforts so your efforts and their efforts will bring additional punch and results that you will feel are more tangible. I am sure some if not most of these organizations will respond to you quite favorably. I can assure P.A.N.D.O.R.A. will be there for you if all possible. As a neuroendocrineimmune disorder patient and as the founder of PA.N.D.O.R.A, I hope to continue to work with you and will always be grateful to you and to Pattie for the dedication you demonstrate to our cause. The world is a much better place simply because you and Pattie are part of our lives." "If you and Pattie were able to deliver such a fabulous advocacy movement while dealing with the kind of personal and health issues you mentioned in your reply [Pattie had major surgery and ice storms requiring evacuation, and Dominie's father was dying], then my gratitude (and my amazement) to you is even more endearing. My heart reaches out to you and to Pattie. From what I saw of the MLC, you had an amazing group of people behind you. Feel free to print my words of gratitude to you and my observations." Marly (Marla) C. Silverman, Founder, P.A.N.D.O.R.A., Inc.
15. September 7, 2005 - From Canada: "I finally received a response to one of my letters for the MLC. It's from the Office of the Prime Minister of Canada via the Executive Correspondence Officer, M. Bredeson. The body of the letter says, 'You may be assured that your comments have been carefully reviewed. I have taken the liberty of forwarding a copy of your letter to the Honourable Ujjal Dosanjh, Minister of Health, who will no doubt wish to give your views every consideration.'"